SINGAPORE (Sept 3): Singapore’s Central Provident Fund ranked 9th in the global provision fund, according to the latest global 300 research from Willis Towers Watson’s Thinking Ahead Institute. The city state maintained its position from the previous year with its assets amounting to US$269.1 billion ($369 billion). This year, Asia featured prominently with a total of seven pension funds in the top 20. Apart from Singapore, Japan’s Government Pension Investment also maintained its top spot with its assets totalling US$1.44 trillion. South Korea’s National Pension came in third, up one spot from last year, while China’s National Social Security kept its spot at 6th. Jayne Bok, head of investments for Asia at Willis Towers Watson says, “Strong performance gains especially in this region during 2017 helped boost many Asian pension funds. However, uncertainties over geo-political and economic events that led to increasing market volatility in 2018 are seen as headwinds to Asia and some emerging markets. The combined assets under management (AUM) for the seven Asian countries in the top 20 accounted for US$3.3 trillion, surging by 25.6% during 2017 and representing 44.3% of assets in the top 20. Within the Global 300, the AUM of all 49 Asia Pacific pension funds increased by 20% to almost US$5 trillion in 2017, outpacing the Global 300 funds’ overall increase of 15.1%. 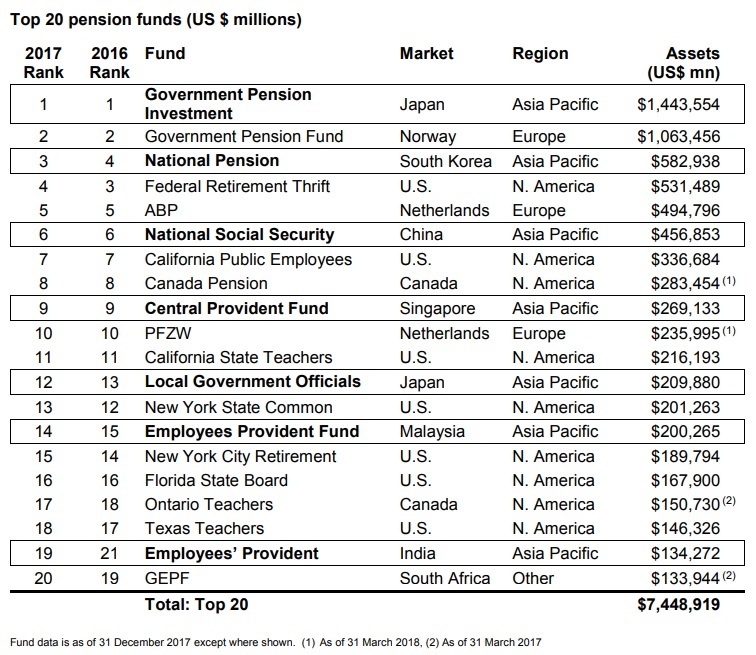 And among the Asia Pacific pension funds, including corporate pension plans in the Global 300, sovereign and public sector pension funds with a total of 32 funds had combined assets of US$4.4 trillion in 2017 and accounted for 24.5% of the total assets. There are 14 domiciled in the Asian (ex-Japan) region, 10 in Japan, seven in Australia and one in New Zealand. “The past 12 months has been a period of change for large pension funds. We saw Asian sovereign and public sector pension funds seeking or taking actions to diversify investments as reflected by new mandates awarded to their asset managers,” says Bok.